In 1925, the building at 1909 Fredericksburg Road, known then as the beautiful Parkmoor Drugstore, was considered one of the first shopping centers in the community. Its architectural design was the 1920’s Colonial Revival style. It clearly was a magnificent piece of art, considered the “Jewel” of its time. Similar designs eventually shaped the development of the Monticello Park, which became one of the most desirable areas in the 1920’s throughout the 1970’s. Unfortunately, in the 1980’s the south half of the building was demolished and left abandoned for more than three decades. 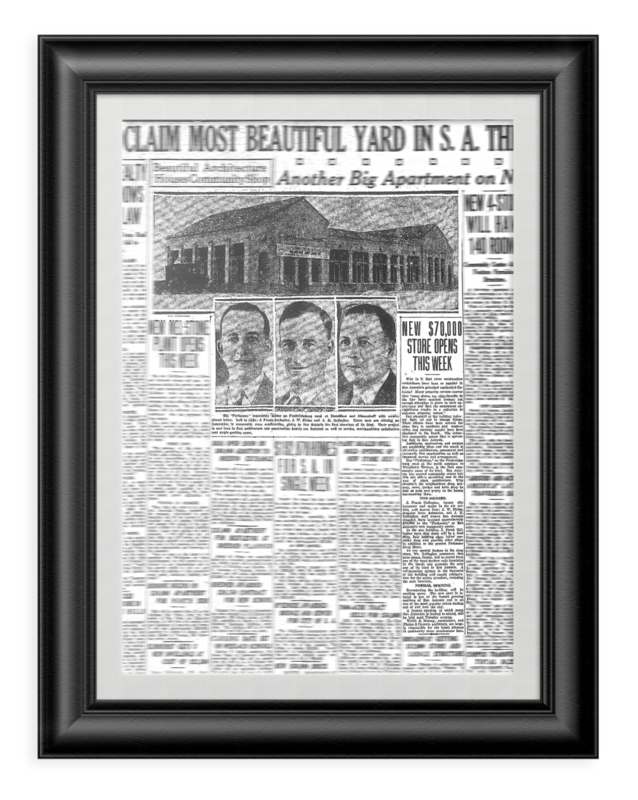 The many years of neglect left the neighborhood locale severely stressed, and dilapidated. Today, thanks to much hard work and team effort, the north side of the building has been restored to its unique state of grandeur. Currently, it is inhabited by The Jewel of Art Dance Studio. Its new title is well-suited for all of the building’s spectacular design. The Jewel of Art is proud to be a part of the Monticello historical district. With great honor we continue the integrity and character of the building. This neighborhood hub will once again be a show stopper. The “diamond in the rough” will serve as the grand jewel for all to see, preserving its place in San Antonio history. But members of the building industry have set out to change things. Their efforts have been noticed for some time in northern and western city and recently results have been displayed in the South. The attractive community center then is spreading first in San Antonio. Architects, Contractors, and owners are circulating ideas and the result is attractive architecture, permanent and substantially fine construction as well as improved service and arrangement. The “Parkmoor,” on the Fredericksburg road at the north entrance to Woodlawn Terrace is the first community store of its kind. San Antonio has several community stores but this one offers something new in the way of store architecture. Why shouldn’t the neighborhood drug, grocery, meat, barber and bake shop be just as neat and pretty as the homes surrounding them? J. Frank Gallagher, former city treasurer and major in the air service, well known here: J.w. 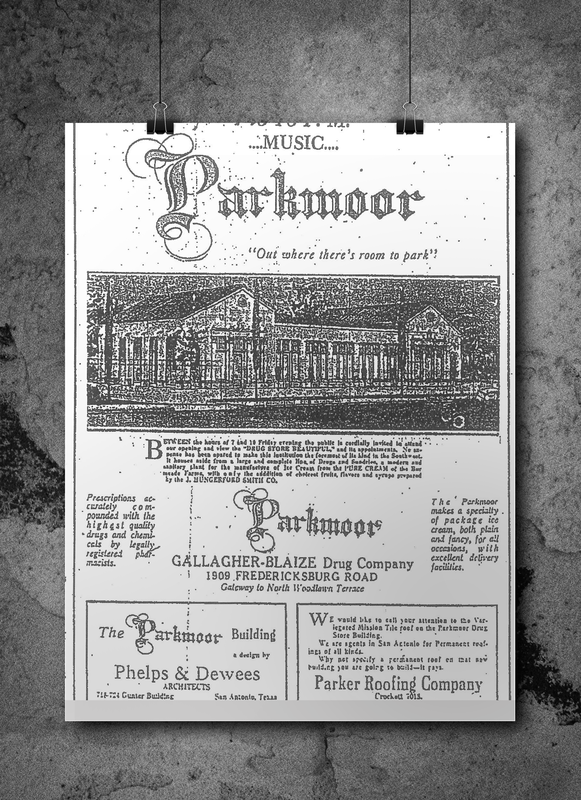 Bluise, druggist from Robstown, and J. E. Gallagher, well known San Antonio druggist, have invested approximately $70,000 in the “Parkmoor,” or San Antonio’s new community center. In the one building, J. Frank Gallagher says that there will be a food shop, hair bobbing shop, ladies specialty shop and possibly other shops in addition to the present Parkmoor Drug Store. As one special feature in the drug store, Mr. Gallagher announces that pure cream, frozen, will be served from on the most modern soda fountains in the South and probably the only one of its kind in San Antonio. A refrigeration system in the basement of the building will supply refrigeration for the entire structure, including the soda fountain.